The Freelance Hunters | Walking a fine line between high adventure and crushing disappointment! This is just a quick news update to let you know that I’m working on the next collection of Freelance Hunters short stories, and you, yes YOU! can get first crack at them by supporting me on Patreon! Dollar level and higher patrons have already read this first print version of The Ice Box, which appeared last year on The Melting Potcast. They also read a brand-new short story, The Wizard’s Chamber. 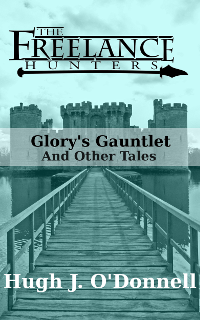 More Freelance Hunters stories will be appearing throughout August and September, and eBook level patrons will get their copies of the next collection, The Gold Equations and Other Tales as soon as it is complete. Podcasts for this collection won’t be dropping until November at the earliest, so don’t wait to get your hands on new Freelance Hunters stories! Glory, Bingo, and Joachim are poised on the cusp of an adventure that will take them to the depths of trap-filled tombs to the tops of mountain fortresses and out into the storm-tossed oceans! You don’t want to miss it so please SIGN UP! As always, thanks for your support, and I hope you enjoy the stories.